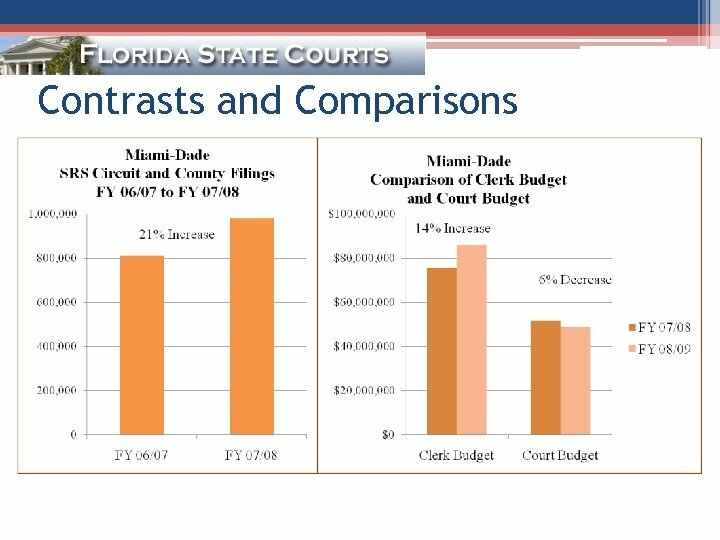 Contrasts and Comparisons • Courts have budgets appropriated by the Legislature and administered under Chapter 216, Fla. Stat. 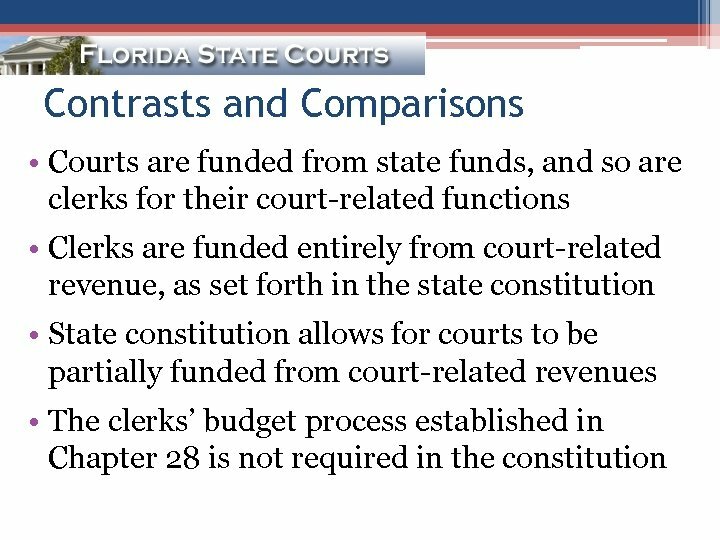 • Clerks’ budgets are not appropriated by the Legislature and are administered under Chapter 28, Fla. Stat. 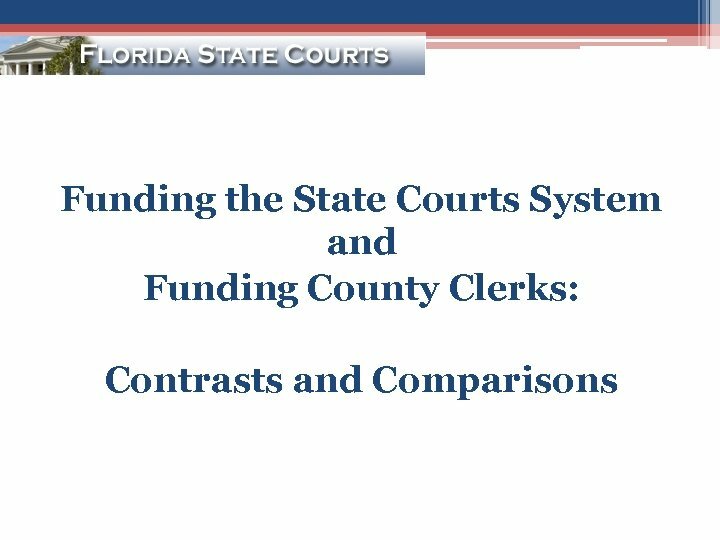 Contrasts and Comparisons Chapter 216 – Court Statutory Budget Controls Chapter 28 – Clerk Statutory Budget Controls • Courts submit budgets to Legislature based on analysis of judicial need. 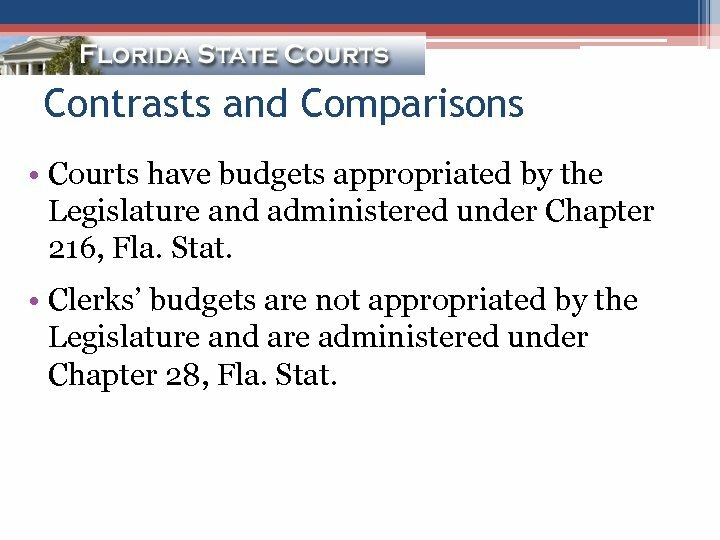 Legislature reviews and appropriates court budgets. 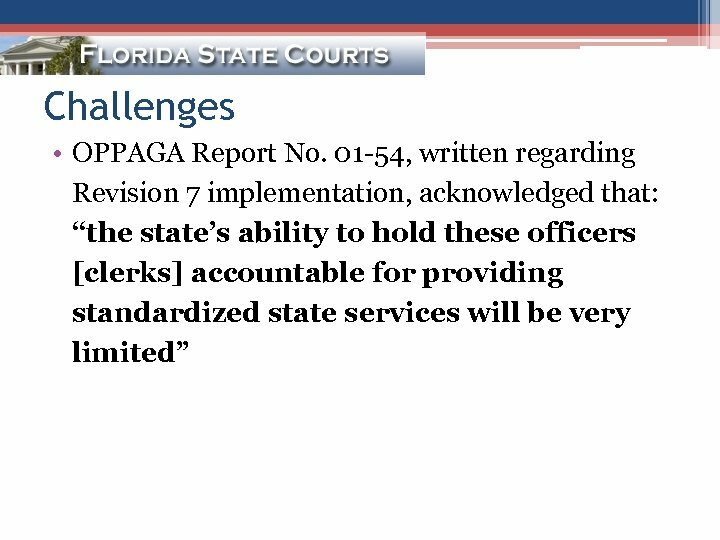 • Clerks submit budgets to CCOC based on amount of money they project they will collect. • Public hearing is required with submission of annual budget request to the Legislature. 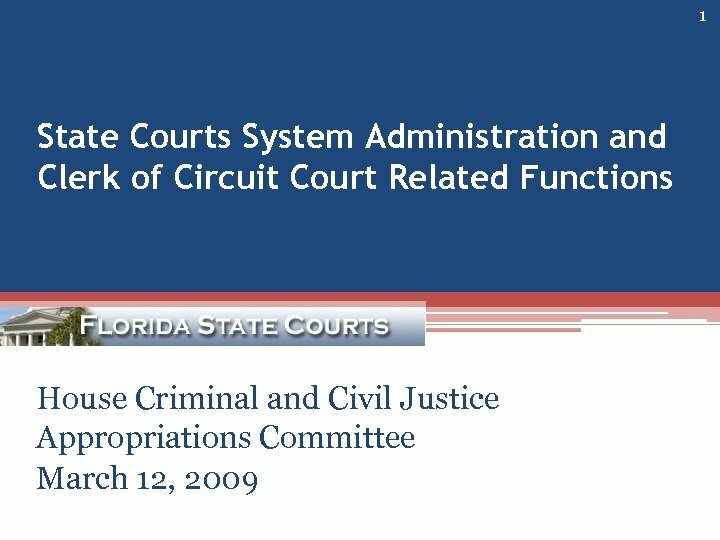 • Court budgets reviewed in legislative appropriations committees. • Governor may exercise veto authority over any line item in court budgets. • Functions of CCOC are carried out by executive council of 8 clerks who review and certify these budgets. 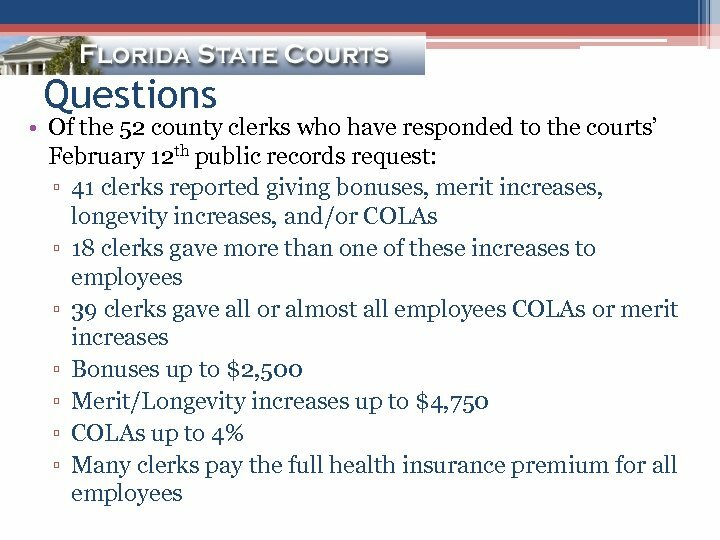 • CCOC certifies to Sen. President, Speaker, CFO, and DOR the budgets, projected revenue, and each clerk eligible to retain some or all of the state’s share of fines, fees, service charges and costs. 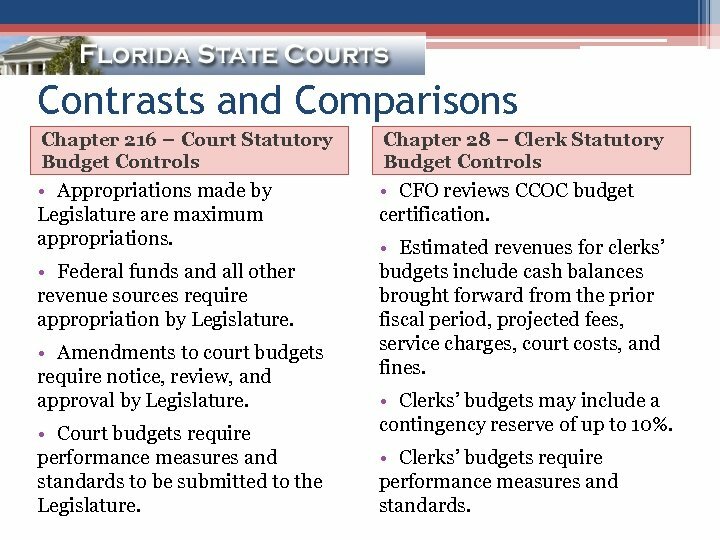 Contrasts and Comparisons Chapter 216 – Court Statutory Budget Controls Chapter 28 – Clerk Statutory Budget Controls • Appropriations made by Legislature are maximum appropriations. • CFO reviews CCOC budget certification. • Federal funds and all other revenue sources require appropriation by Legislature. 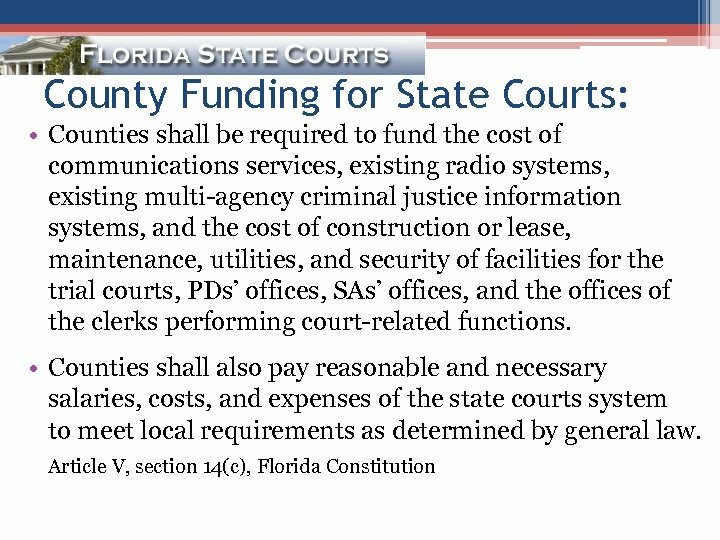 • Amendments to court budgets require notice, review, and approval by Legislature. 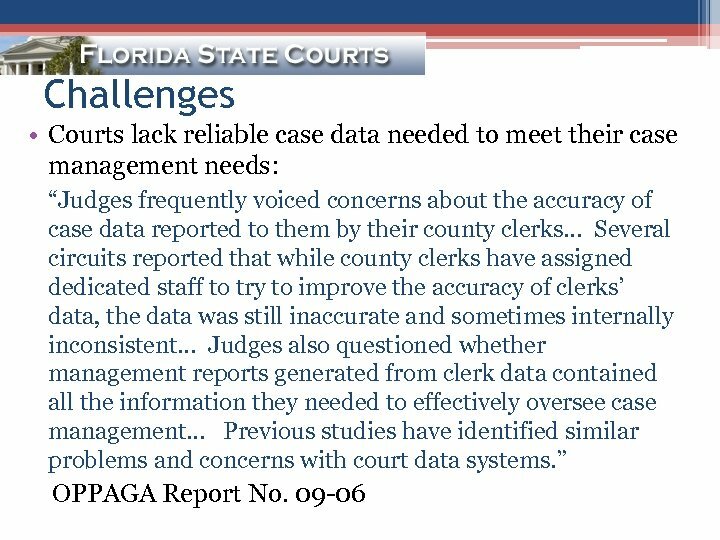 • Court budgets require performance measures and standards to be submitted to the Legislature. 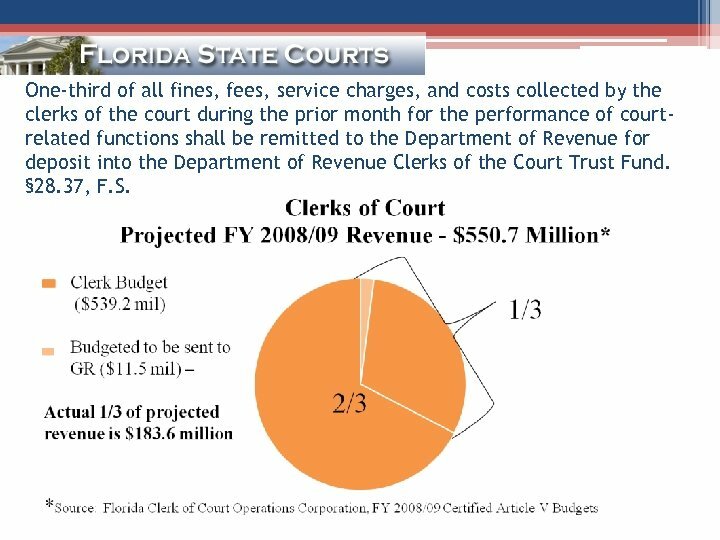 • Estimated revenues for clerks’ budgets include cash balances brought forward from the prior fiscal period, projected fees, service charges, court costs, and fines. • Clerks’ budgets may include a contingency reserve of up to 10%. 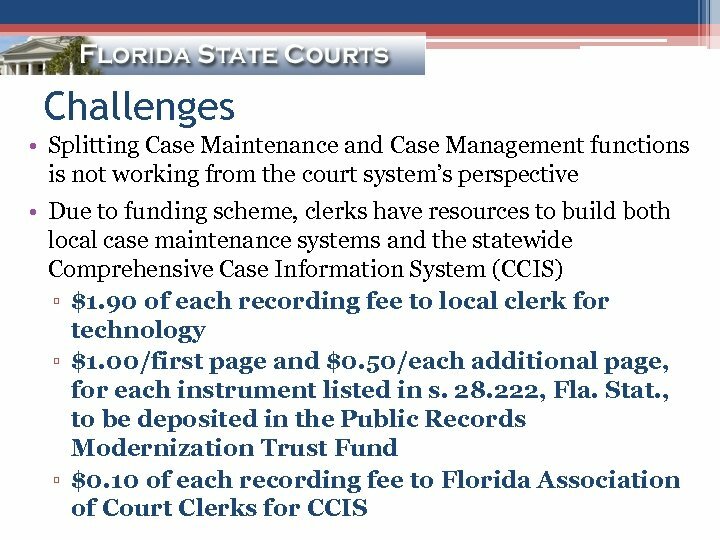 • Clerks’ budgets require performance measures and standards. 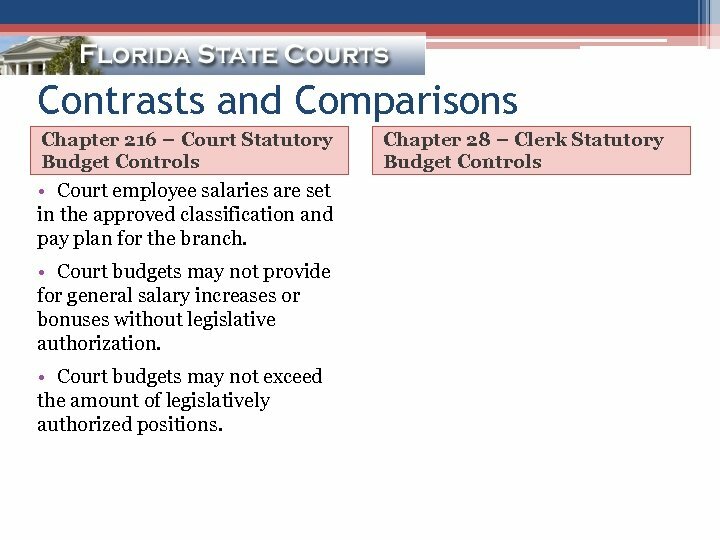 Contrasts and Comparisons Chapter 216 – Court Statutory Budget Controls Chapter 28 – Clerk Statutory Budget Controls • Court budgets are subject to annual cash release plans set by the Governor and CFO. • The LBC may approve increases to maximum annual clerks’ budgets to provide for new or additional functions due to changes in law, or to pay for the costs of supporting increases in the number of judges or magistrates. 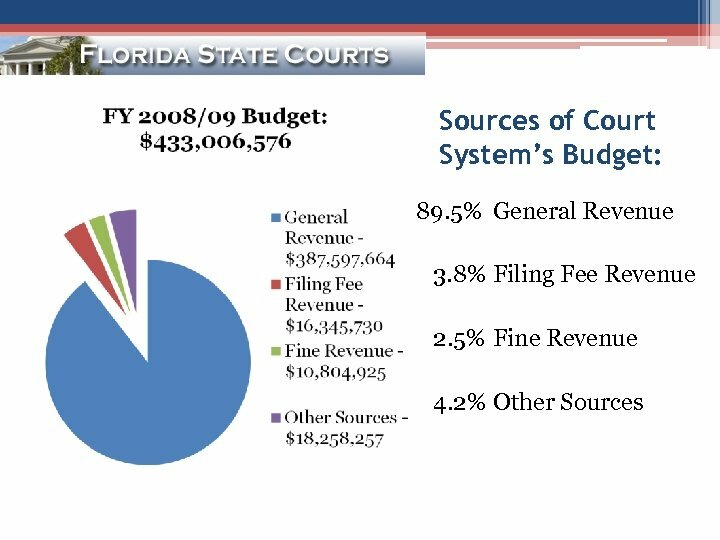 • Courts must cover any projected deficits from within their legislatively authorized budget. 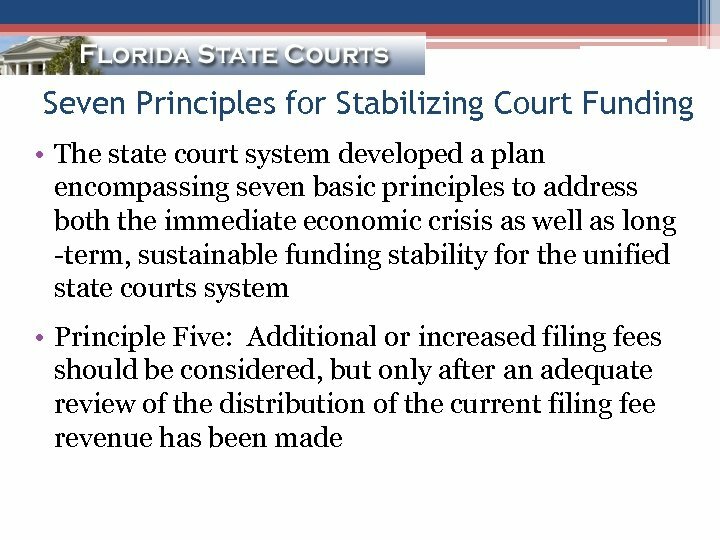 • Actions to cover statewide deficits that impact court budgets are directed in statute. 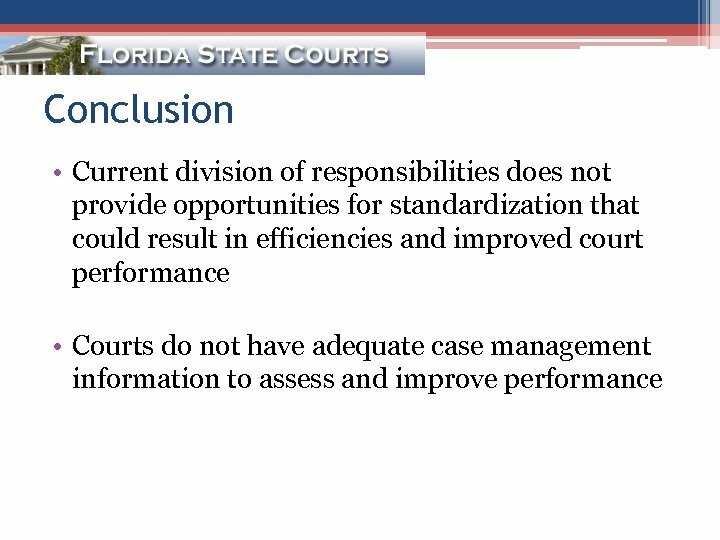 • Court budgets do not have a contingency reserve. 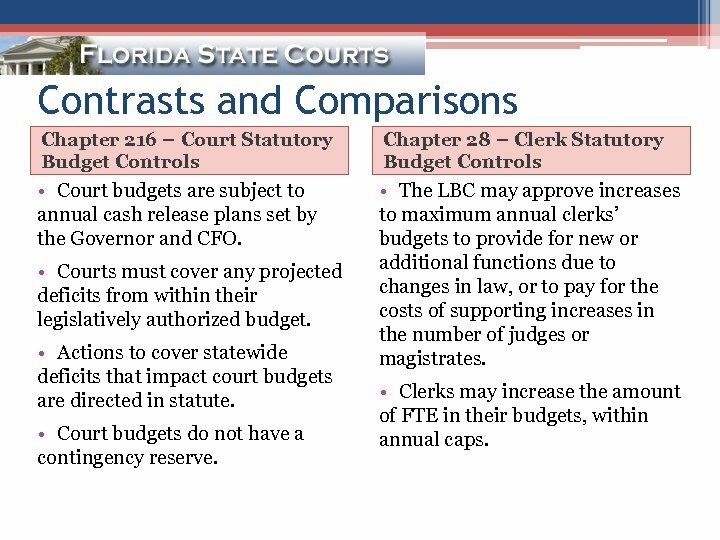 • Clerks may increase the amount of FTE in their budgets, within annual caps. 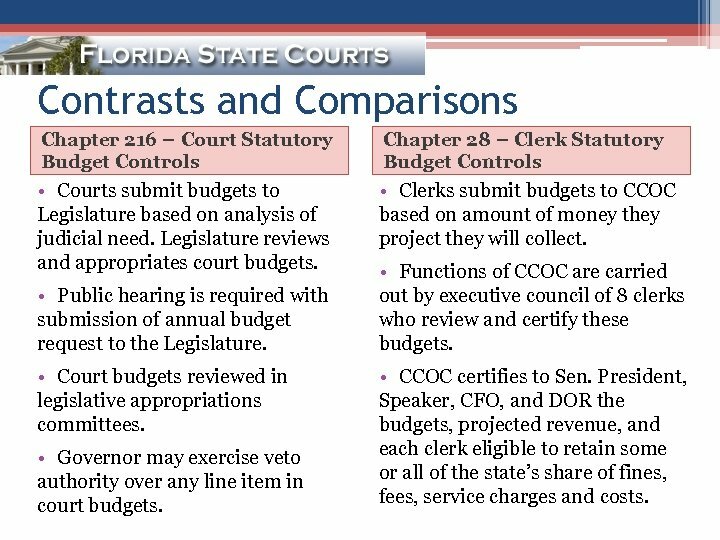 Contrasts and Comparisons Chapter 216 – Court Statutory Budget Controls Chapter 28 – Clerk Statutory Budget Controls • Court GR budgets revert to state at end of each fiscal year for use by the Legislature. 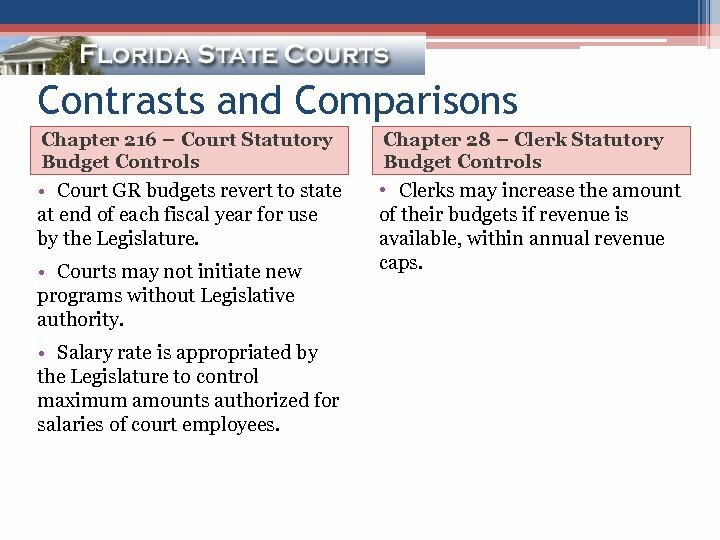 • Clerks may increase the amount of their budgets if revenue is available, within annual revenue caps. 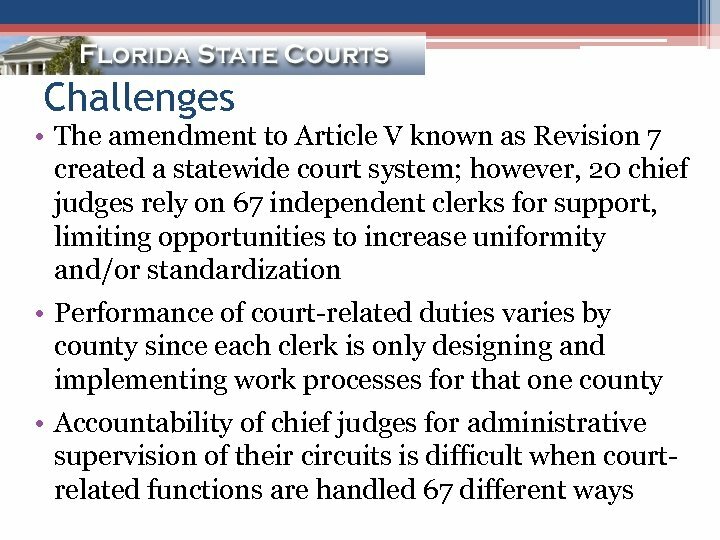 • Courts may not initiate new programs without Legislative authority. 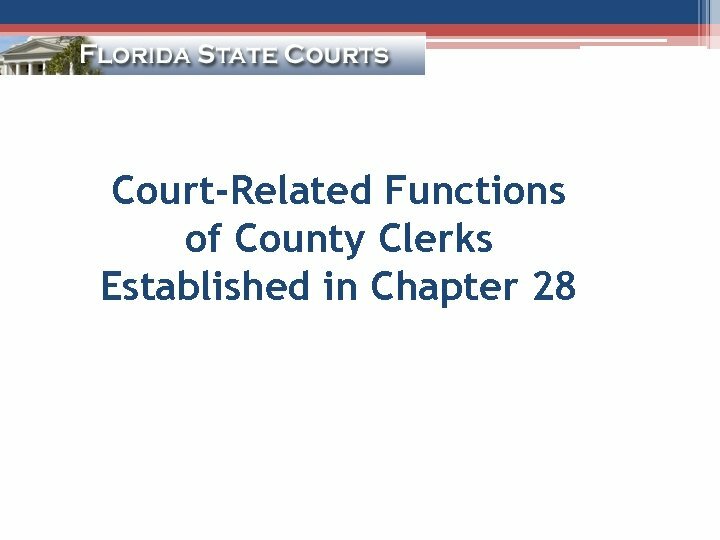 • Salary rate is appropriated by the Legislature to control maximum amounts authorized for salaries of court employees. 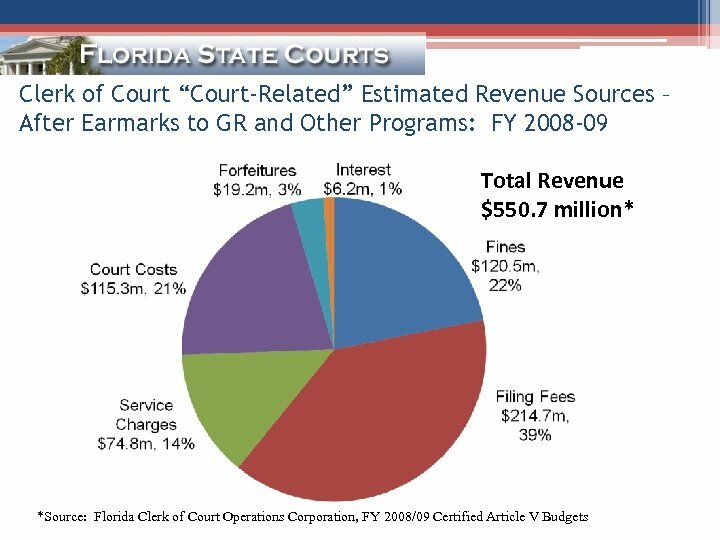 Total “Court Related” Revenue From Filing Fees, Fines, Service Charges, and Court Costs FY 2008 -09 (including 12 A) Directly to GR *Includes $13. 4 million for Mediation and Court Education Trust Fund, $10. 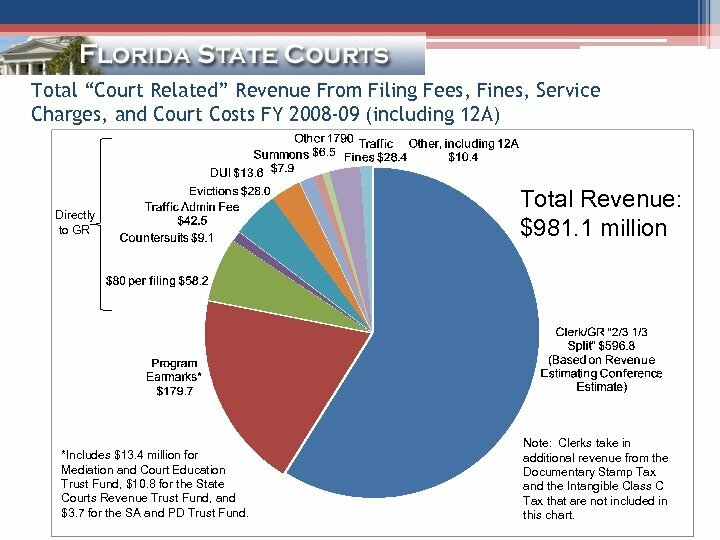 8 for the State Courts Revenue Trust Fund, and $3. 7 for the SA and PD Trust Fund. Total Revenue: $981. 1 million Note: Clerks take in additional revenue from the Documentary Stamp Tax and the Intangible Class C Tax that are not included in this chart. 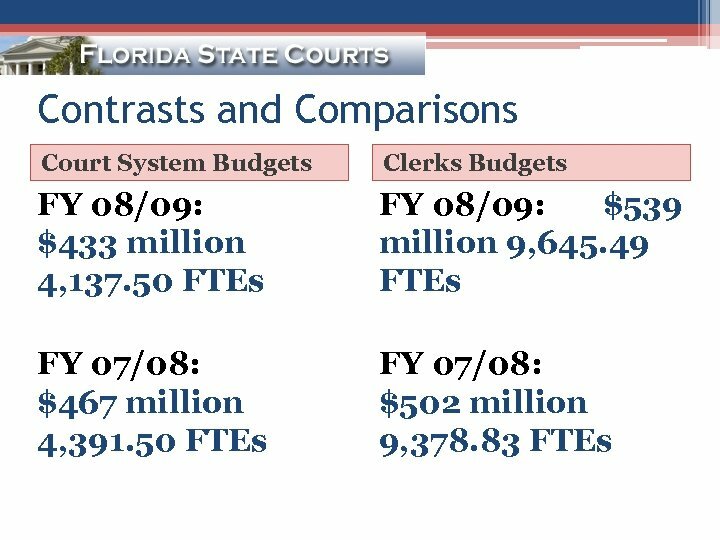 Contrasts and Comparisons $600, 000 $500, 000 Clerks of Court and State Courts System Expenditures vs. Budget 33% 13% 22% 23% $400, 000 FY 2004 -05 FY 2005 -06 $300, 000 FY 2006 -07 FY 2007 -08 FY 2008 -09 $200, 000 $100, 000 $0 Clerk Budget Court Budget Clerk Expenditures Court Expenditures Clerks expenditures excludes amount budgeted for capital; data is unknown. 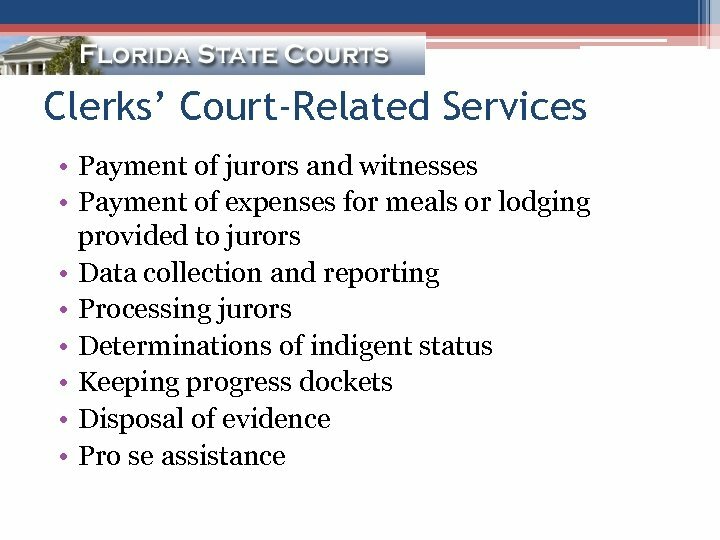 Source: Florida State Courts System. 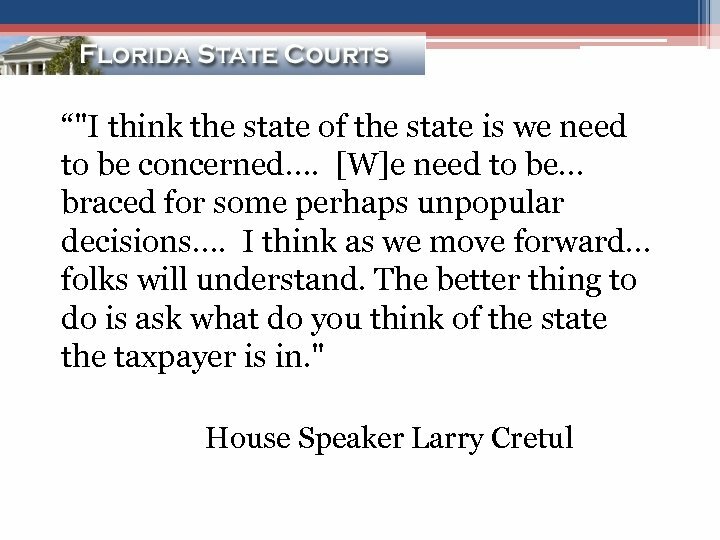 Florida CCOC, Certified Article V Budget. 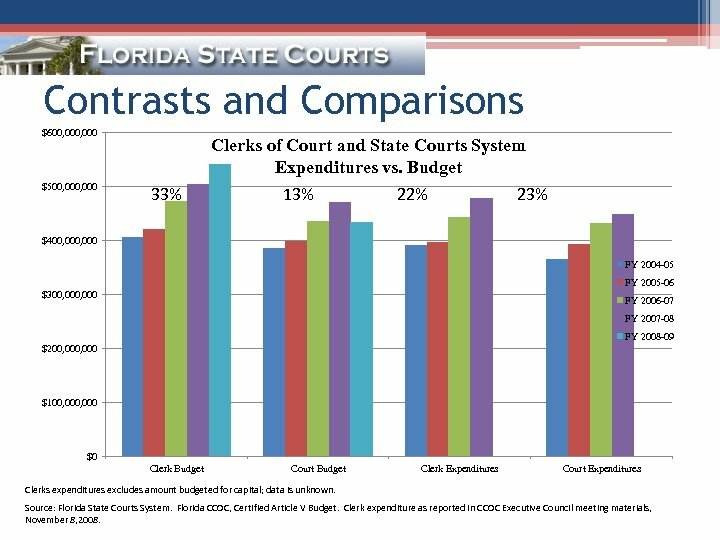 Clerk expenditure as reported in CCOC Executive Council meeting materials, November 8, 2008. One-third of all fines, fees, service charges, and costs collected by the clerks of the court during the prior month for the performance of courtrelated functions shall be remitted to the Department of Revenue for deposit into the Department of Revenue Clerks of the Court Trust Fund. § 28. 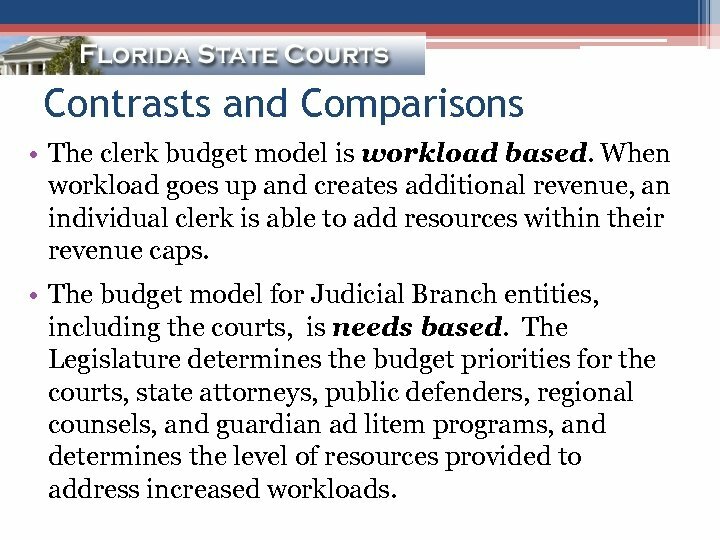 37, F. S.
Contrasts and Comparisons • The clerk budget model is workload based. When workload goes up and creates additional revenue, an individual clerk is able to add resources within their revenue caps. 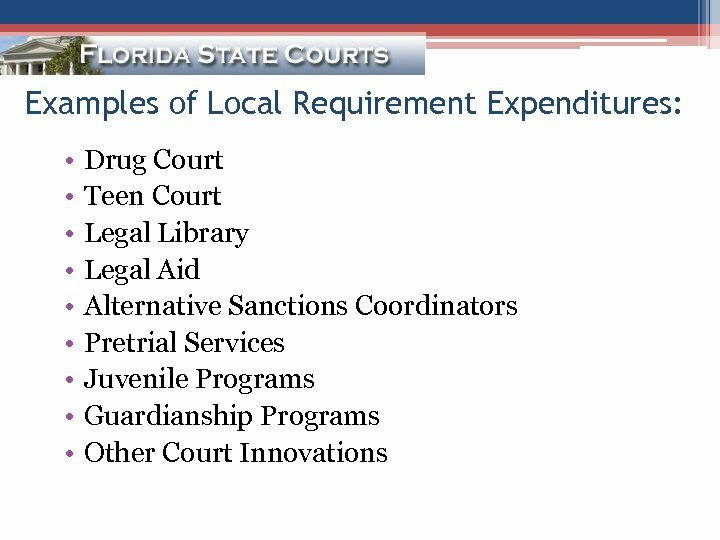 • The budget model for Judicial Branch entities, including the courts, is needs based. 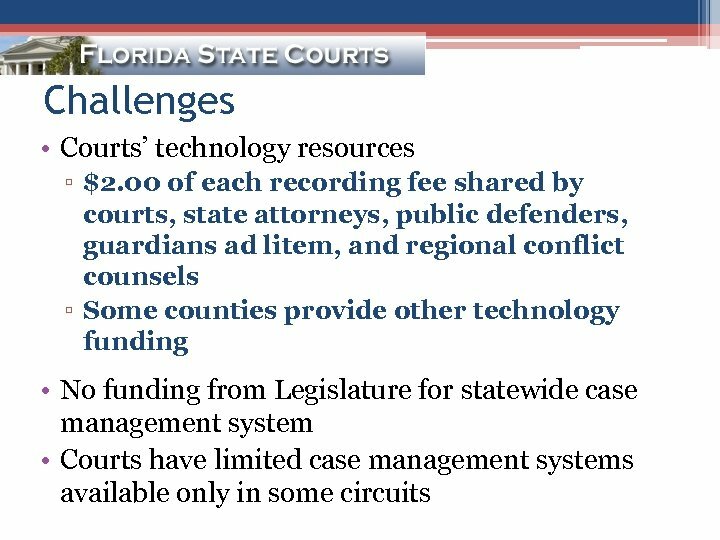 The Legislature determines the budget priorities for the courts, state attorneys, public defenders, regional counsels, and guardian ad litem programs, and determines the level of resources provided to address increased workloads. 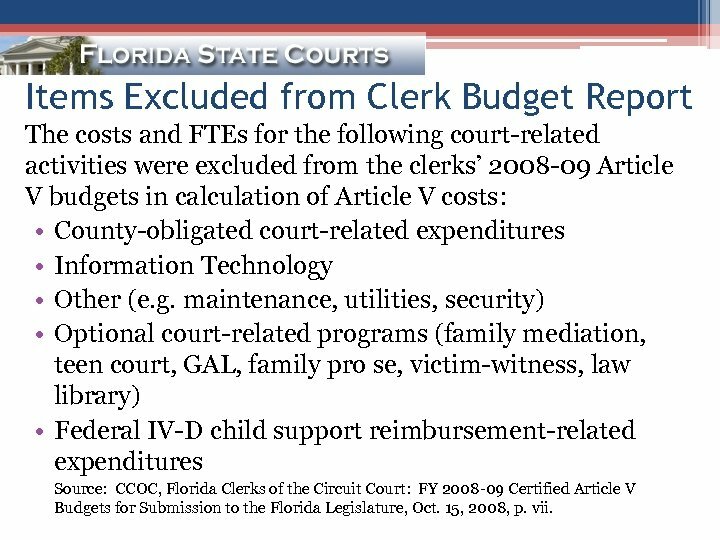 Items Excluded from Clerk Budget Report The costs and FTEs for the following court-related activities were excluded from the clerks’ 2008 -09 Article V budgets in calculation of Article V costs: • County-obligated court-related expenditures • Information Technology • Other (e. g. maintenance, utilities, security) • Optional court-related programs (family mediation, teen court, GAL, family pro se, victim-witness, law library) • Federal IV-D child support reimbursement-related expenditures Source: CCOC, Florida Clerks of the Circuit Court: FY 2008 -09 Certified Article V Budgets for Submission to the Florida Legislature, Oct. 15, 2008, p. vii. 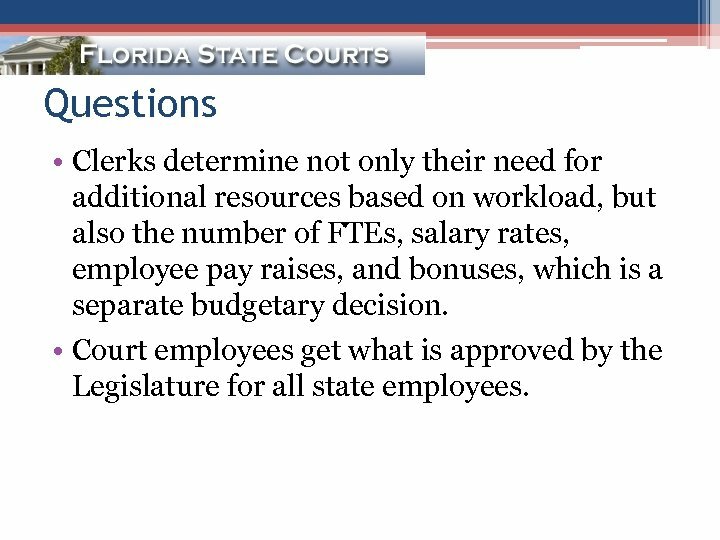 Questions • Clerks determine not only their need for additional resources based on workload, but also the number of FTEs, salary rates, employee pay raises, and bonuses, which is a separate budgetary decision. 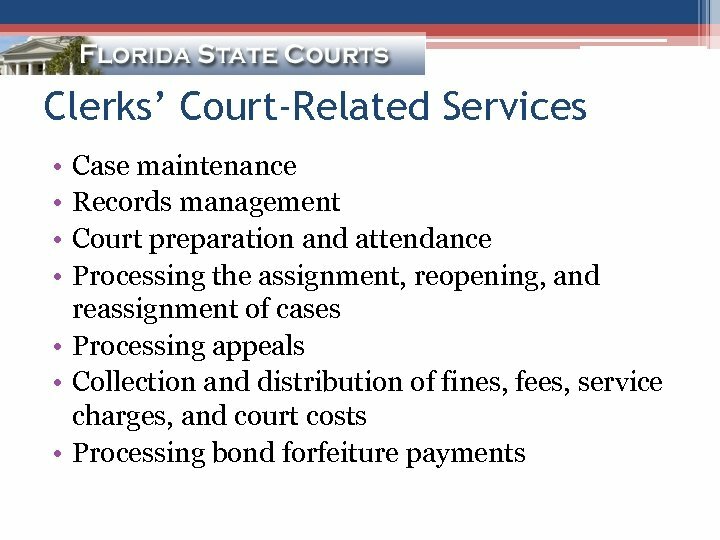 • Court employees get what is approved by the Legislature for all state employees. 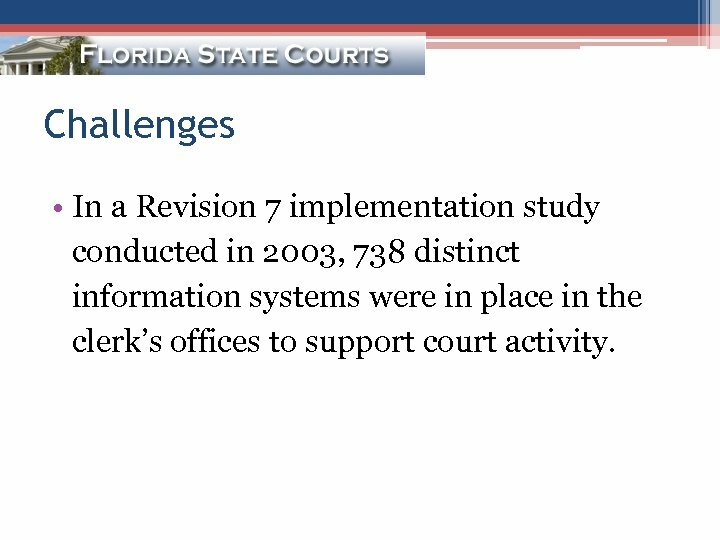 Challenges • In a Revision 7 implementation study conducted in 2003, 738 distinct information systems were in place in the clerk’s offices to support court activity.